"...could venture to say that this song is the absolute peak in the entire careers of either Dio, or Blackmore. The album is worth getting for this epic track, alone..."
But it seems in Dio's old age, his voice has been shot. The enunciation is weakened, and his range seems to have been cut in half (or more). And did Blackmore take lessons from Satriani? Wait! This isn't the classic Rainbow lineup. 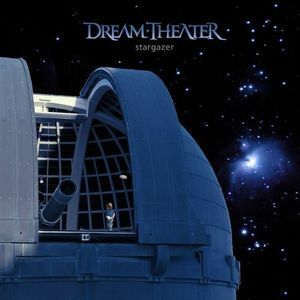 This is...this is Dream Theater. They are covering the epic Stargazer, and guess what? They don't change anything. This sounds so much like the original, it is almost painful when the band deviates (by adding some annoying keyboard solos, or turning the guitar section into "generic shred solos A, B, and C". To be fair, the song is a bit heavier, but not by much. I was actually surprised by how little the overall heaviness hadn't been changed. At times, I'd almost say that the original had more force to it. And of course Labrie has a lesser range and power than Ronnie. Structurally, this is a clone. The guitars have more distortion, and the solo sections have a few extra notes here or there, which I feel makes the solo lose the fiery locomotive crash build up it originally had. This doesn't feel like a great band making a classic in their own image. This feels like a great band milking their influences a bit too heavily. Really, James is easily the weakest man, here. His singing is quite good, and at times, splendid. But Dio could sing him into convulsions. At the end of the song, though, I do realize that it does sound good. It isn't necessary at all. No, I can and will easily say that I prefer the original. I am amazed to say that I think Dream Theater have succeeded in making the keyboards sound even more vintage than the original 70's ones. Two stars, for the nice epic feel I get. Dream Theater have done better, and Rainbow did this, better.